As an NRI, if his time zone varies and he cannot keep up with day-time trades, he can execute AMOs (after-market orders). With AMOs, you can even execute orders once the market closes until the next morning, when it opens. After staying overseas for a long time, Rahul is now looking to invest in the Indian stock markets. Quelling initial inhibitions about his eligibility considering the fact that he is an NRI (Non-resident Indian), Rahul found out that he can indeed invest there, after an NRI colleague, citing his own example, clarified and affirmed the same. Now, although this information has given Rahul more hope regarding his investment prospects in India, he still does not know how to begin. However, his colleague came to his rescue and enlightened him about the process. Open an NRE/NRO account: Having an NRE (non-resident external) or NRO (non-resident ordinary) bank account is mandatory for an NRI looking forward to invest in India. NRE and NRO bank accounts are basically Rupee accounts for NRIs where the latter can park their foreign funds. These accounts are similar in terms of operations but offer different repatriations on interest and the amount in the account. Thus, based on the requirements, you can open an NRE or an NRO account with any bank by submitting all required KYC (Know your customer) documents. Get a Permanent Account Number (PAN): A PAN card can be obtained from the Income Tax department right at your doorstep. All one needs to do is file an application and submit it with the required documents and proofs. This can just as easily be done online. PAN is required not only to make investments but also for tax-related matters. Get a PIS permission letter: Under the PIS (Portfolio Investment Scheme), the RBI (Reserve Bank of India) allows NRIs to invest in the shares of Indian companies. For this, a PIS permission letter from the RBI, which allows you to invest in stock-related assets, is required. This procedure aims to ensure regulatory monitoring of the concerned NRI’s investments. Declare a mandate holder: Rahul would need to fill and sign the “Appoint a Mandate” form to appoint a local person to take care of his NRE account. This person in question will also be required to sign the mandate. A mandate can manage chequebooks (issue/draw cheque), making payments, use ATM cards, make deposits, etc., on the primary investor’s behalf. Execute a Power of Attorney (PoA): After signing a power of attorney, the concerned person will get the powers to make and redeem Rahul’s investments and manage the paperwork on his behalf. Open demat and trading accounts: Finally, Rahul will have to open demat and trading accounts with SEBI registered brokers to invest in the Indian markets. To open these accounts, you need to submit KYC documents along with service charges. 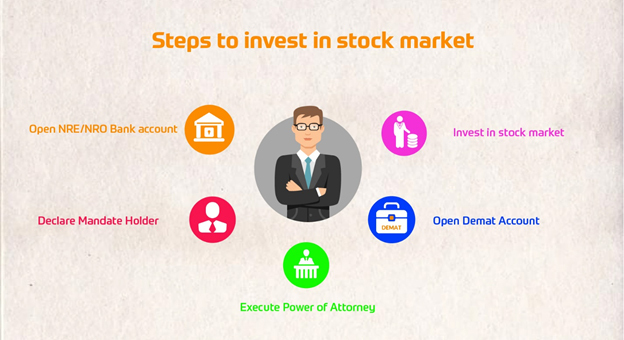 Research and invest: Once the demat and trading accounts have been opened, Rahul will be able invest in Indian capital markets through direct equities, buy selected bonds and convertible debentures, as well as invest in ETFs (exchange-traded funds) and mutual fund portfolios. As an NRI, if his time zone varies and he cannot keep up with day-time trades, he can execute AMOs (after-market orders). With AMOs, you can even execute orders once the market closes until the next morning, when it opens. This will give Rahul ample time to make an analysis. All in all, it is not that difficult for Rahul to invest in his home country; he just needs to complete the required formalities.